Empire Earth II Gold Edition includes the original Empire Earth and the official expansion, Empire Earth II: The Art of Supremacy. 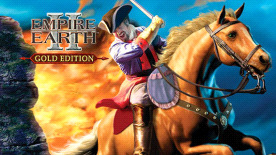 Prepare to serve up worldwide conquest on an epic scale once again with Empire Earth II. Become the greatest conqueror of all time by creating, building and forging the grandest of all empires as you progress through 15 epochs that span more than 10,000 years of history. Introducing new units, powers and leaders through 3 expansive campaigns, Empire Earth II will once again set the standard for real-time strategy games with the latest technology and features that expands the single-player. A Battle for the Ages - Relive more than 10,000 years of history as you lead one of 14 different civilizations spanning 3 distinct campaigns that feature all-new units, powers and leaders under your control. Advanced Opposition - Challenge an all-new reactive and dynamic artificial intelligence system that will adapt to your every move and test the limits of your strategic warfare knowledge. Enhanced Environmental Realism - Adapt to ever-changing weather conditions and constantly revolving seasons that will impact your civilization's growth and necessitate new tactical initiatives. Improved Management Systems - Simplify your resource management with an advanced Picture-in-Picture (PIP) system that will allow you to maintain distinct control over various regions of your civilization in real-time. That, along with the all-new citizen manager system and revamped research system, will alleviate the need to micro-manage your civilization during the heat of battle. Empire Earth II: The Art of Supremacy will return gamers to the front lines of the greatest battles in history with new civilizations at their command, new campaigns and a host of new features that make this year's best strategy game more addicting than ever. Bold victories on far-off battlefields, from wintry Russian plains to scorching African deserts, will establish the player's undisputable reputation as the world's greatest leader - past, present and future. Two new modes, including Fealty Mode, where players on the ropes can declare "fealty," to become a permanent ally or vassal to another player; and Tug-of-War Mode, where multiple battles are fought across three, five, or seven maps with ultimate victory coming from defeating a foe on their home map. Three new globe-spanning campaigns will allow gamers to relive more of mankind's most legendary moments, from the time of the Pharaohs to the reign of Napoleon. Ten new combat units, including Zulu Warriors, Russian Howitzers, and Rafale Stealth fighters, with which to conquer the world's most powerful foes. Upgrades from regular units to powerful Heroes in victory. The ability to conquer, assimilate or ally with Native Tribes. New persistent units that will remain and retain upgrades across multiple scenarios. New strategies to master in new game modes, with advanced units and additional civilizations. A new editor that allows the player to create unique custom civilizations. Please note: This is a single player only title.